As I commented on the Buy High Sell Higher Forum this week, nothing much is happening on the markets. I even re-opened the ability for new members to join, and it didn’t even result in the usual onslaught of spam. It doesn’t get much deader than that. It would appear we are stuck in a trading range, the mid-summer doldrums, which will either continue forever, or break one way or another. A review of the Dow for the last three years shows an up-channel since the end of the 2008 crash, followed by a brief but severe correction last summer and fall (that took the Dow from around 12,750 to below 10,500 in about three months. 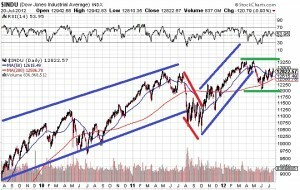 Since then the Dow rallied to 13,250 and all looked well with the world, before a slide back to 12,000. We have since meandered back to just under 13,000 (which is where we were in 2007, in case you are wondering). That’s five years of essentially no net movement. The only question now is will the money printers at the Fed keep pumping until we get through the election, or will the problems of the world overtake them and render the goal of more upside impossible. 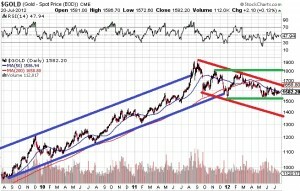 Gold, on the other hand, had a much more sustained and impressive run, going back a decade, before peaking last Fall, and then dropping back to almost the $1,500 level. You can interpret the chart as you wish. The red channel could be a down trend, started last fall, that may continue. Or, more likely, the green channel is a trading range, with just over $1,500 as the base, and $1,800 as the upper end. Which way will it end? I have no idea, but here’s a hint: If we drop much below $1,500 it won’t look pretty. A close decisively above $1,800 would be much better news. And that’s the problem. As an investor, we really have no idea what will happen, and with uncertainty we make the only rational decision, which is to stay in cash. And if we are all in cash, it’s likely we will remain in a trading range. It does appear to me that the stress of the populace may be bubbling up, perhaps fed by the media in their ever increasing desire for “pageviews”, so increasing tension may lead to a break out, or break down. We shall see.